Tried-and-true silhouettes, easy prints, and modest styles. We break down the characteristics that define traditional style. When filling out your Dia&Co style profile, did you realize that you had a hard time articulating your personal style? You’re not alone—for so many plus size women, we’ve had such limited clothing options that we haven’t had the freedom to explore unique styles. Because the plus size customer has been lumped into catch-all categories, you may realize that you don’t have the words to define your style other than “plus size.” In our “What’s My Style” series, we’re breaking down various style categories so you can best define what works best for you—and today, we’re taking on traditional style. The word traditional can be confusing. Oftentimes, “traditional”, when referring to garb is referencing clothing that originates from a specific country or faith. Around the world, traditional dress can range from women wearing a sari in India to men wearing embroidered tunics, known as “barong tagalog”, in the Philippines. In this post, we’re breaking down plus-size traditional outfits in a western context. This style can also be called conservative as it usually does not showcase much skin or feature flashier statement pieces. While traditional style has a lot in common with classic style as neither are driven by trends, the difference is that someone with classic style takes risks with bold colors or fresh silhouettes, while those with traditional style tend to stick with tried-and-true silhouettes and stays away from bolder statement pieces. To help you get a feel for what traditional style is, here are some good rules of thumb. You’ve ever gone back to the store to buy more of those pants you love, but this time in different colors. You find yourself wearing clothes from many years ago because your style hasn’t changed much over time. You know what you like and no matter how the trends change, you won’t be wearing skinny jeans or a crop top anytime soon. Wearing something super glamorous or eye-catching garners too much attention for you. A fashion risk for you is trying something you wear all the time but in a new color or print. Your fashionable friend has encouraged you to try something that terrifies you, though you often see others trying out. Having a stylist or someone else shop for you can be tricky because you don’t like to try items that are far out of your comfort zone. You love to experiment with new trends and find new ways to wear the items in your closet. Your style changes as trends change. You’d much rather stand out than blend in. You prefer fast fashion stores with low prices and the latest trends to stores that have the same wardrobe essentials on rotation. You love having someone else shop for you because it encourages you to try new things. The clothing you wore years ago has been (or needs to be) donated because it no longer serves you. Interesting or unique prints and colors are something you’re always drawn to. All this being said, traditional style can be a lot of fun! Here are some traditional outfit ideas to inspire you. If any of them jump out to you, be sure to let your Dia Stylist know! A khaki Bermuda short is a staple in a traditional wardrobe. 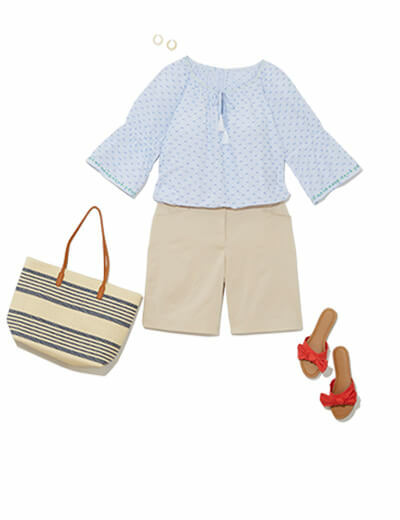 Paired with a flowy peasant top and red slides, this look has a classic Americana feel. 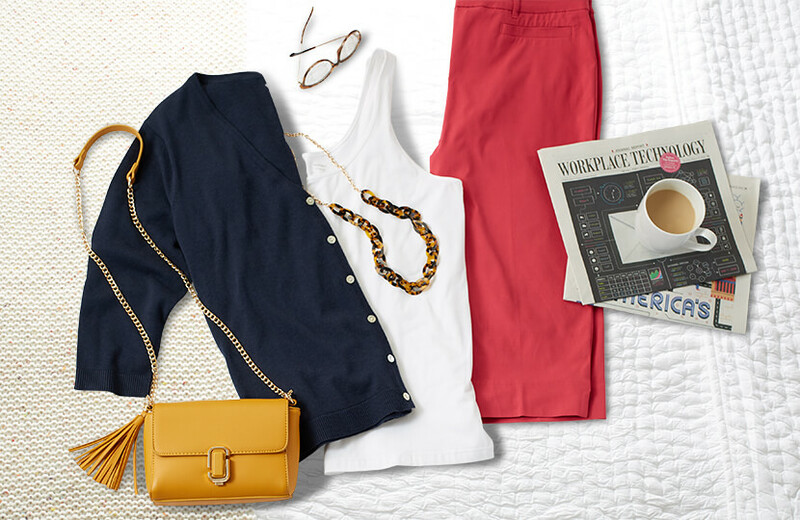 Shorts in a bold hue give your outfit an extra punch of color. With metallic accessories and an embroidered top, this casual look becomes sophisticated. 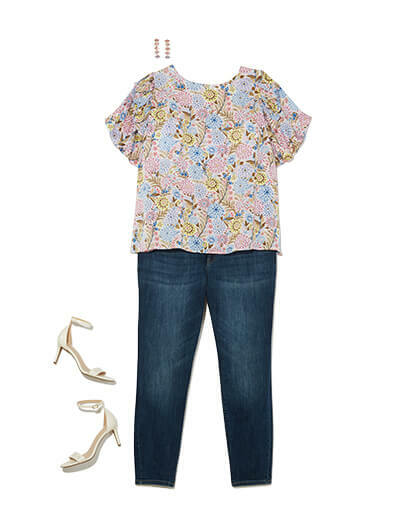 A crew neck blouse in a gorgeous print keeps your outfit conservative and feminine. Dark-wash denim and neutral heels make the outfit clean and simple. Keep your arms and chest covered with a long-sleeved dress that has a high neckline. Neutral accessories let the dress shine. A printed dress with a three-quarter length sleeve is perfect for the office. 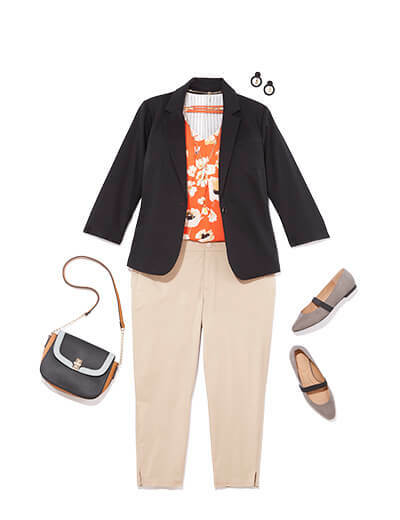 Paired with flats and your go-to work bag, this outfit is as beautiful as it is easy to wear. Khakis and a blazer is a tried-and-true workwear ensemble. 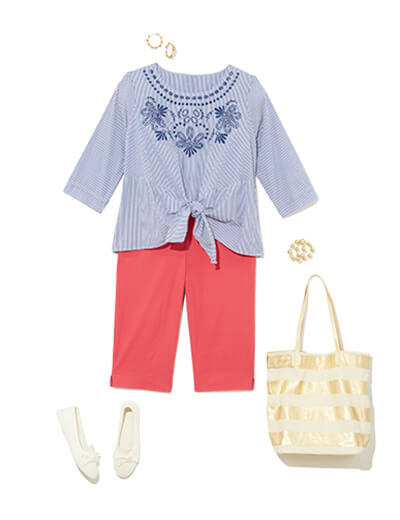 With a blouse in a bold color, this look gets a fun refresh. 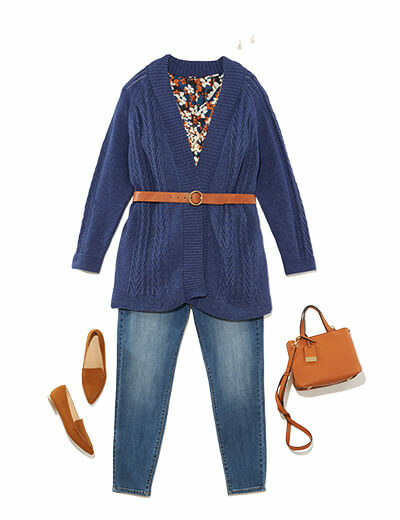 A cozy cardigan-and-denim outfit gets an instant update with thoughtful accessories. A shapeless sweater transforms into a curve-hugging top with a waist belt. Black trousers and a flowy blouse are wardrobe staples for any traditional closet. A cargo jacket, pendant necklace, and scarf give this trusty look a new life. Do the pieces in these outfits look like items from your closet? If so, make sure to update your preferences and let your Dia Stylist know that you’re a traditional dresser. Are these outfits something that you wouldn’t wear? It’s just as important to know what you don’t like as it is to know what you do! Maybe you are more of a boho babe, a glam girl, a preppy princess, or prefer the fuss-free ease of casual style. Or perhaps you’re a combination of two or three styles? Whatever you determine best describes your style, let your Dia Stylist know so you can have the best Dia Style Box possible.